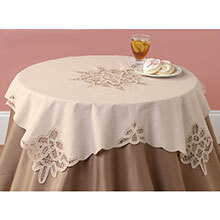 Airy cutwork patterns in elegant, cotton dress up the dining table, lovely for important gatherings. Our Battenburg Round Topper also adds a pretty layer to a decorative table next to your sofa or bed. Machine wash. Imported. 36" dia. Hurry! Quantities are limited!